Our range of products include Amifull-forte Syrup, Bexolex Capsule, Bexolex Syrup, Bexoliv Capsule, Bexoliv Syrup and Bilby Tablet. 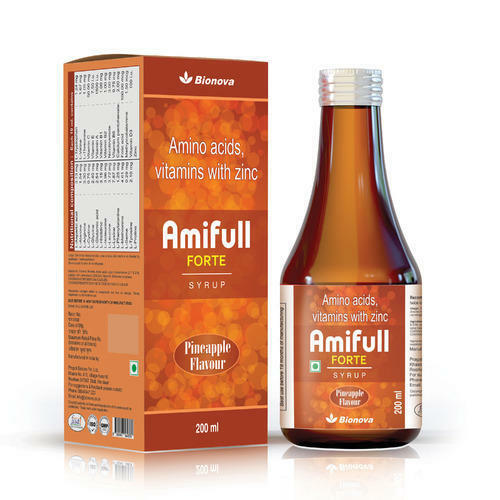 Amifull forte is a nutritional supplement of amino acid, vitamins and minerals. The deficiency of amino acids can result in fatigue, chest pain, muscle pain and weakness. Amifull forte capsules help for faster recovery in the cases of trauma, burns, prolonged illness, tissue building and repair, and also in pre and post-operative cases. They are often recommended for athletes, individuals under high stress, vegetarians with low protein intake and others. The majority of health issues such as obesity, high-cholesterol levels, diabetes, insomnia, dysfunction, hairloss or even wrinkle formation or arthritis can essentially be traced back to metabolic disturbances. B1 (Thiamine) B1 helps the body make healthy new cells. It’s often called an anti-stress vitamin because of its ability to protect the immune system. Studiessay this vitamin is necessary to help break down the simple carbohydrates. B2 (Riboflavin) This B vitamin works as an antioxidant to help fight free radicals (particles in the body that damage cells) and may prevent early aging and the development of heart disease. Riboflavin is also important for red blood cell production, which is necessary for transporting oxygen throughout the body. Several studies suggest B2 can help stave off migraines, but more research is needed to be done. B6 (Pyridoxine) Along with fellow B vitamins 12 and 9, B6 helps regulate levels of the amino acidhomocysteine (associated with heart disease). Pyridoxine is a major player in mood and sleep patterns because it helps the body produce serotonin, melatonin and norepinephrine, a stress hormone. Some studies suggest vitamin B6 can reduce inflammation for people with conditions like rheumatioid arthritis. B12 (Cobalamin) This B vitamin is a total team player. Cobalamin works with vitamin B9 to produce red blood cells and help iron do its job: create the oxygen carrying protein, hemoglobin. Since vitamin B12 is only found in animal products, studies show higher rates of non-meat eaters with a deficiency. “But unless you are a strict vegan or vegetarian,” Zuckerbrot says, “it’s not hard to get enough of this vitamin in your diet.” For those who are deficient, it may be necessary to supplement the diet with B12. Zinc supplementation improves immunity. Zinc deficiency also had direct effects on the gastrointestinal tract such as impaired intestinal brush border. Zinc supplementation improves the transport of water and electrolytes across the intestinal mucosa in experimental zinc insufficiency. Zinc plays a fundamental role in cellular metabolism and is postulated to modulate host resistance to various infections. BEXOLIV Capsule is a unique combination of Silymarin with vitamins of the B-complex group. The hepatoprotective effect of BEXOLIV Capsule is accomplished via several mechanism including anti-oxidation, inhibition of lipid per oxidation, enhance liver detoxification and glucuronidation and protection of glutathione depletion. Studies have also shown that BEXOLIV Capsule exhibits anti-inflammatory effects, including inhibition of leukotriene and prostaglandin synthesis, mast cell stabilization, and inhibition of neutrophil migration. In addition, BEXOLIV Capsule has been shown to increase hepatocyte protein synthesis, thereby promoting hepatic tissue regeneration. BEXOLIV Capsule reduces the conversion of hepatic stellate cells into myofibroblasts, slowing or even reversing fibrosis. Clinical studies have demonstrated BEXOLIV Capsule to have immunomodulatory effects on the diseased liver. The combination of Silymarin with Vitamin B complex in BEXOLIV Capsule provides for a comprehensive therapy of various liver disorders. Bilby Tablet is a combination of Ginkgo Biloba with B-vitamins. Ginkgo biloba, is known as the maidenhair tree, it is one of the oldest species of trees on the planet. The plant has a number of therapeutic properties and contains high levels of flavonoids and terpenoids these are antioxidants that provide protection against oxidative cell damage from harmful free radicals.Ginkgo Biloba works by increasing blood flow to the brain and through the entire body's network of blood vessels, which supplies oxygen and nutrients. Good blood circulation is essential for good health - better blood circulation promotes general longevity and helps to keep you healthy.Bilby Tablets are formulated with an optimum complex of Fiveessential B vitamins which are included for the role they play in supporting normal neurological and psychological functions alongside vitamin C.
Specially formulated nutritional supplement for asthmatics & to improve function of lungs. N-Acetyl L cysteine helps to break up trapped mucus and enhance its clearance from the bronchial passages, thereby improving the flow of air in and out of the lungs in people with COPD. In addition, N-Acetyl cysteine is the precursor of glutathione, one of the major antioxidants in lung tissue. Vitamin C improves lung function, decreases incidence of attacks. Magnesium helps to regulate smooth muscle contraction and relaxation. Research showed that low magnesium intake may be involved in the etiology of asthma and chronic obstructive airways disease. Vitamin D3 It helps absorb calcium. Further calcium helps as membrane stabilizer. Green tea extract helps to inhibit IgE-mediated release of histamine and peptide leukotriene from human basophils and mast cells. Selenium is a trace mineral and important as an antioxidant. Studies have shown that patients with chronic asthma may have lower levels of selenium. Vitamin B12 is helpful in reducing wheezing and it improves the breathing upon exertion in asthma sufferers. Vitamins may help to reduce asthmatic symptoms by improve lung function in people with asthma. Calcium is a mineral that is found naturally in foods. Calcium is necessary for many normal functions of your body, especially bone formation and maintenance. Calcium can also bind to other minerals (such as phosphate) and aid in their removal from the body. Calcium citrate is used to prevent and to treat calcium deficiencies. lcium is a mineral that is found naturally in foods. Calcium is necessary for many normal functions of your body, especially bone formation and maintenance. Calcium can also bind to other minerals (such as phosphate) and aid in their removal from the body. Calcium citrate is used to prevent and to treat calcium deficiencies .The body needs Vitamin D to absorb calcium. Without enough Vitamin D, one cannot form enough of the hormone calcitrol (known as “active vitamin D”).This in return leads to insufficient calcium absorption from the diet. In this situation, the body must take calcium from its stores in the skeleton, which weakens existing bone and prevents the formation of strong, new bone. Additionally Magnesium helps keep calcium in the cell to do its job far better. Zinc is known to play an important role in the bone remodeling cycle and it also essential for many bodily functions including the immune response, reproduction, growth, development and neurological roles. Carbonyl iron, a dietary supplement, is used for the treatment and prevention of iron deficiency anemia and associated problems. Carbonyl iron is a mineral iron that is vital for oxygen transport in red blood cells. The combination is used to treat or prevent a lack of these nutrients which may occur in certain health conditions (e.g.,anemia, pregnancy, poor diet, surgery recovery). Iron is an important mineral that the body needs to produce red blood cells. Vitamin C improves the absorption of iron from the stomach. Vitamin B12 is important for normal blood, cells, and nerves. Folic acid is needed to form healthy cells, especially red blood cells.Women of childbearing age should maintain adequate amounts of folic acid either through diet or supplements to prevent spinal cord birth defects. Carbonyl iron, a dietary supplement, is used for the treatment and prevention of iron deficiency anemia and associated problems. Carbonyl iron is a mineral iron that is vital for oxygen transport in red blood cells. The combination is used to treat or prevent a lack of these nutrients which may occur in certain health conditions (e.g., anemia, pregnancy, poor diet, and surgery recovery). Vitamin B12 is important for normal blood, cells, and nerves. Folic acid is needed to form healthy cells, especially red blood cells. Women of childbearing age should maintain adequate amounts of folic acid either through diet or supplements to prevent spinal cord birth defects. Folic acid is the member of B-vitamin group. Folic acid is necessary for the synthesis of DNA, RNA and protein. It is especially important during periods of rapid cell division and growth such as infancy and pregnancy. Deficiency of Folic acid in pregnancy results in an increased risk of neural tube defects. Folic acid deficiency leads to megaloblastic anemia. Additional signs are weakness, sore tongue, headaches, heart palpitations, irritability and behavioral disorders. CARVI- 1000 contains L-Carnitine, a naturally occurring metabolite. Its main function is to regulate the free fatty acid metabolism for production of energy, by facilitating the transport of FFA through inner mitochondrial membrane. Thus, it plays a fundamental role as in many fatal disorders like cardiovascular disorders, post- dialysis complication, primary and secondary deficiency of carnitine. L-Carnitine can be synthesized in the body from amino acids like Lysine. Dietary sources such as meat and dairy products also provide carnitine. Asparagus Racemosus is considered to be the most helpful herb for women as it helps in balancing the female hormonal system. The main herbal rejuvenative for women.Asparagus Racemosus nourishes and cleanses the blood and the female reproductive organs thus supporting the body's natural fertility. It nourishes the womb and ovum and supports the female organs for pregnancy. It also promotes body's natural lactation. Asparagus Racemosus contains phyto-estrogens, the precursors of estrogen and is very useful for women who suffer from low natural estrogen levels as a result of menopause, hysterectomies or oophorectomies. CARDI-NRG is a combination of the most important energy-generating nutrients. Of all the nutritional factors required for life, L-carnitine, coenzyme Q10, magnesium, and vitamin E must be ranked among the most important for optimizing mitochondrial energy production. Other nutrients are essential, to be sure, and the emphasis on CCME should not be interpreted as diminishing the cardiovascular benefits of niacin, riboflavin, pantothenic acid, thiamin, and many other nutrients and food factors.